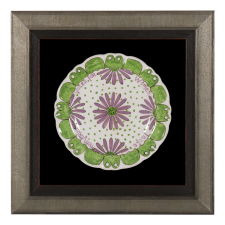 Frame Size (H x L): 10" x 10"
English porcelain plate, made for the Women's Suffrage movement in the U.K. One-of-a-kind among presently known examples, this wonderful Arts & Crafts design features a green, frog-like pattern around the border, surrounding violet and green or daisies, on a polka dot green background. Interspersed between the flowers are the words "Votes for Women" and, in Latin, the phrase "Facta non Verba," which translates to "Deeds not Words." When the militant Suffrage campaign began in 1905, and Christabel Pankhurst and Annie Kenney are famously arrested and imprisoned, these two phrases were adopted as campaign slogans. 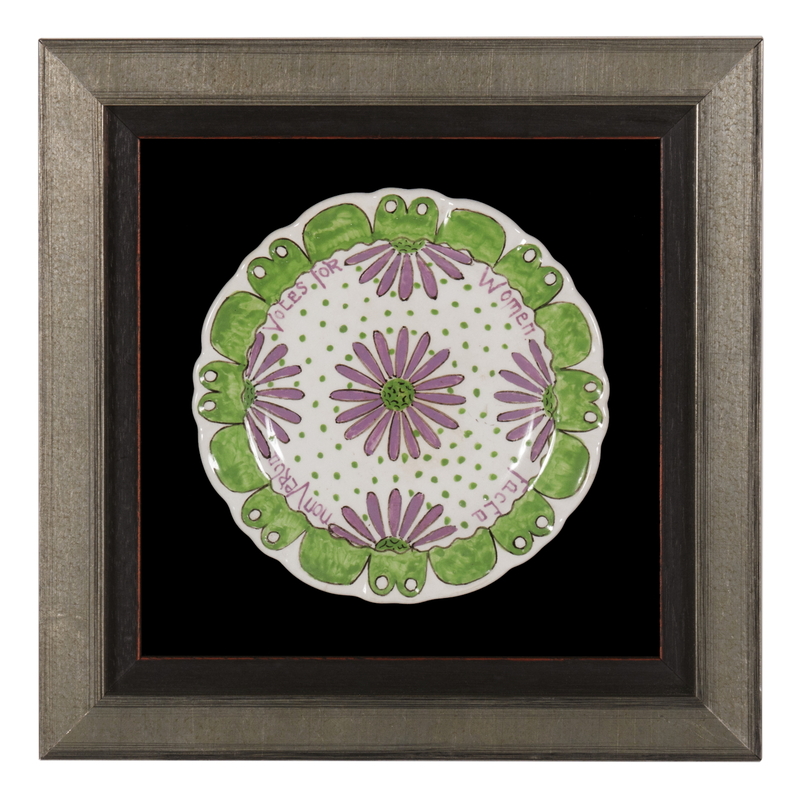 A few different styles of English porcelain service pieces were made for the American market, beginning around in 1909, first by Minton, and later by John Maddock & Sons. 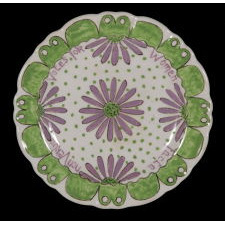 These were commissioned by prominent American socialite Ava Belmont, initially for events held at her Newport, Rhode Island mansion, "Marble House," and later for the lunchroom at the New York headquarters of a Suffrage organization that she helped found, called the Political Equality Association. 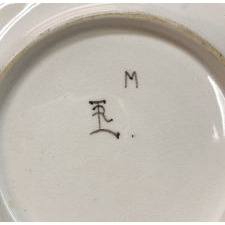 Simplistic in their design, these were white ironstone with blue lettering and or pin-striping, and similar to the industrial dinnerware services used by railways, hotels, and private clubs. 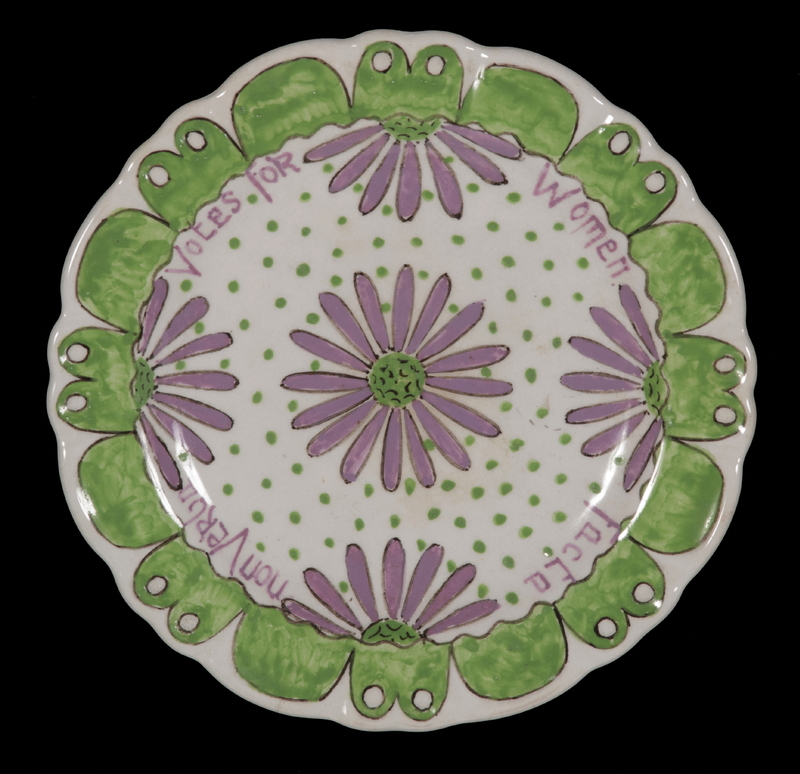 While many objects were produced in the U.K. in green and purple, to be worn or displayed as subtle means of proclaiming support for Suffrage issues, especially jewelry, this is the only piece of English dinnerware that I have ever encountered with the actual slogans of the Suffrage movement. While the maker of the plate is unknown, it is signed on the reverse with a mark that is probably artistically symbolic of the initials "T," "R," and "L," accompanied by the letter "M." Thus far I have not been able to identify these markings, but research is ongoing. Suffrage came to an end for some of the English population in 1918 with the passing of the Representation of the People Act. This allowed men over 21 and women over 30 to vote. Ten years later, in 1928, an amendment to the act extended the entitlement to everyone over the age of 21.